Abstract : We introduce a novel framework for interactive landscape authoring that supports bi-directional feedback between erosion and vegetation simulation. Vegetation and terrain erosion have strong mutual impact and their interplay innuences the overall realism of virtual scenes. Despite their importance, these complex interactions have been neglected in computer graphics. Our framework overcomes this by simulating the eeect of a variety of geomor-phological agents and the mutual interaction between diierent material and vegetation layers, including rock, sand, humus, grass, shrubs, and trees. Users are able to exploit these interactions with an authoring interface that consistently shapes the terrain and populates it with details. 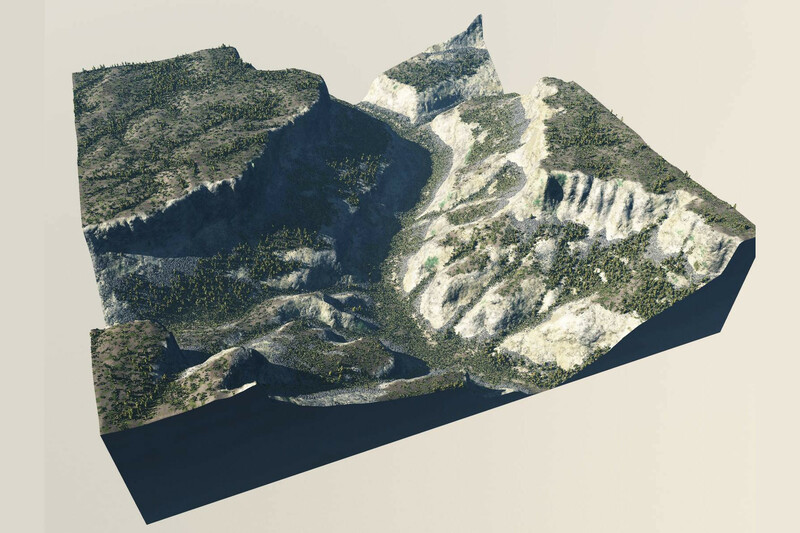 Our method, validated through side-by-side comparison with real terrains, can be used not only to generate realistic static landscapes, but also to follow the temporal evolution of a landscape over a few centuries.